Last night I wound up at a friend's house, making dinner for two: Stir-fried Udon with Sugar Snap Peas, some serious IPA, and dark chocolate with peppermint for dessert. Stir-fries are such an easy pure veg staple, and this one is simple and tasty. I added sugar snap peas last night but you can add broccoli, shelled edamame, tofu, or anything else you may have in your kitchen. Plus? It's a breeze to make up a separate batch and toss in some beef or chicken for the omnivores in the family. To start: Bring a small pot of water to boil over high heat. Add the udon and let cook for 5 minutes. Remove from heat and drain; set aside in a colander. Start the stir-fry: Heat the oil over high heat in a wok or large frying pan. Add the snap peas and stir fry until just golden brown on the outsides, adding some of the tamari as you go. 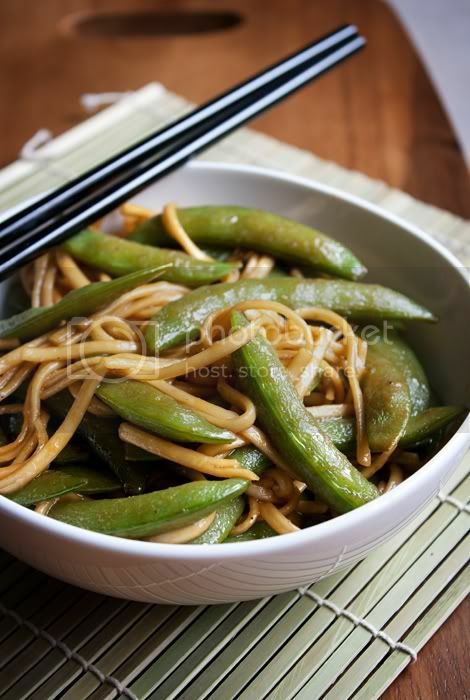 Move peas aside in the wok and add the udon. Stir fry and add the rest of the tamari, and the rice vinegar. Toss and cook until noodles are just golden brown and most of the liquid has cooked down. Turn off heat and add sesame oil, and season with salt and pepper. Serve hot in bowls and eat with chopsticks.